MOST OF US TAKE the beating of our hearts for granted. For many heart failure patients, however, those beats are not so reliable. In some, different portions of the heart contract at different times, wasting energy and resulting in poor pumping of the blood and overall weakness. A specialized treatment, called cardiac resynchronization therapy (CRT), implants a pacing device to restore proper heart contractions. But there’s a catch: some patients require customized placement of the CRT stimulation wires or personalization of pacemaker settings—and the possible permutations are vast. That’s the challenge facing Kenneth Bilchick, MD, from cardiology and Jeff Holmes, MD, PhD, from biomedical engineering. 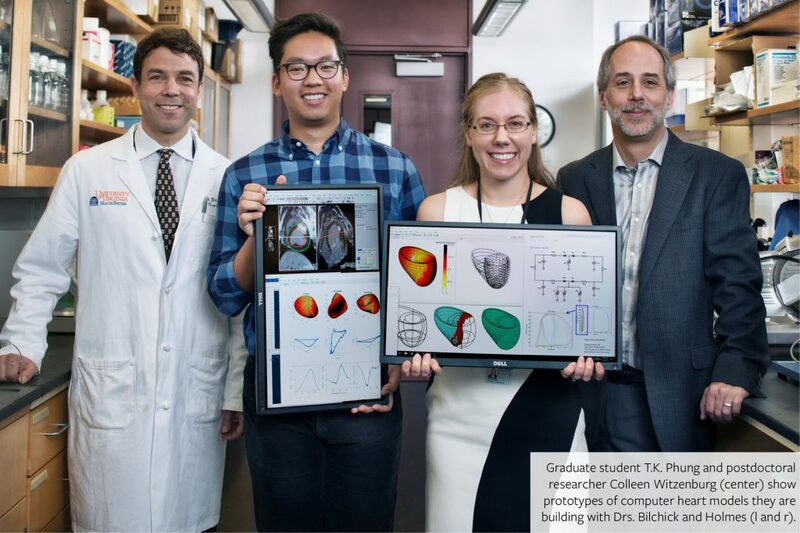 Together, these researchers envision a Virtual CRT computer program that will allow physicians to screen and identify the best stimulation locations and patterns for any individual patient, prior to implanting the device. The best part? The Virtual CRT software will run in five minutes or less on a desktop PC. When used as part of routine pre-implantation planning, the Virtual CRT will enable physicians to place and program stimulation that is specifically customized to each individual patient. This work has recently received significant support from a private family foundation interested in UVA research.